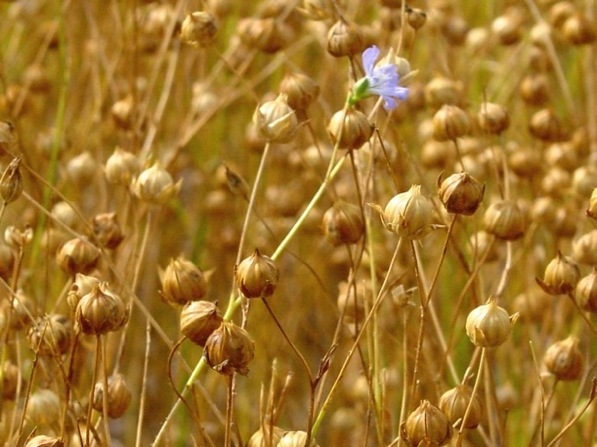 Flax Fiber, both Soluble + Insoluble, are important for Healthy living! ~~ Flax Fiber ~~We hear that we need enough fiber in our diets, but WHY? -The Short Answer: Fiber is essential for moving out waste + everything the body doesn't want, including cholesterol + toxins. Golden Flax seed is a high fiber food + arguably one of the best for the healing + cleansing benefits of the digestive system! There are ~8 grams of fiber -soluble + insoluble in 2 Tbls of Golden Flax Seed! Fiber is found in our diets through whole grains-including Golden Flax seed, fruits, vegetables, nuts, beans + peas (legumes). Dietary fiber is part of the plant that doesn't break down during digestion; fiber is the moving force to keep the digested food, water, + waste moving through the intestines. Flax Fiber is composed of Soluble + Insoluble Fiber, which work together in different ways to move waste through the colon while cleansing + protecting the digestive system. The SOLUBLE + INSOLUBLE fiber in Golden Flax seed helps pull toxins + cholesterol, while healing the gut. ~One kind of Soluble Fiber is Flax Mucilage, which is what makes flax become gelatinous if left sitting in liquid, and is essential for helping to cleanse and heal the colon with its medicinal emollient and demulcent properties. ~Help make bowel elimination easier by reducing irritation on the gut + bulking up stools with gelatinous mucilage. ~ The insoluble fiber in flax exercises the bowel muscles as it helps broom out debris from the colon and provides bulk for the formation of feces. ~ Also, this special dietary fiber in flax gently cleans excess mucus and other debris from the small intestine, improving absorption. Help you live a Healthier life! Healthy adults should eat 25-35 grams of Fiber every day. The American Dietetic Association estimates that Most people in the US only eat ~11 grams of fiber a day. No wonder there is an increase in preventable disease! We NEED our fiber! What is the difference of dietary fiber + fiber? Fiber refers to all fiber, while dietary fiber refers to fiber we eat. When we talk about fiber, we are meaning fiber we eat, so for our discussions, fiber and dietary fiber are essentially interchangeable. Golden Flax Seed for your Flax and Fiber Benefits!!! Back to top of Flax Fiber.